Earplugs and other forms of hearing protection are crucial parts of ensuring the health and safety of your workers. 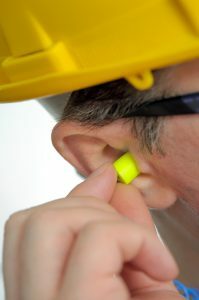 Hearing protection is a crucial part of ensuring the health and safety of your workers. Reducing or minimizing the amount of noise that your workers encounter make a tremendous difference. There are numerous ways you can ensure hearing protection is properly introduced and followed. Here are just some of those ways. Hearing protection often starts with the most basic standards. For instance, providing simple earplugs or earmuffs can start to reduce the noise around the workers. In fact, in environments where the noise level is about 85 decibels, it is a virtual necessity that these workers have some form of hearing protection since anything above 85 decibels is unsafe and dangerous to the human ear. How effective the hearing protection you provide is given a score based on Noise Reduction Rating (NRR) scale. Insulating walls, ceilings, and floors can also benefit your workers. Insulation can muffle dangerously loud noises. Using eco-friendly construction materials in your building is a trend that is gaining steam. By choosing these materials, you can keep sources of excessive noise contained within one section of your building and prevent it from reaching other areas. One simple solution concerning workplace layout is to divide employee areas from louder areas containing noisy machines. This method of hearing protection becomes increasingly useful when barriers are installed to help deflect or diffuse the concentration of noise. Upgrading your building’s noisy equipment so that they run more quietly and smoothly is another great way to protect your employees’ hearing. Not only do newer machines make less noise, but improved equipment can also save you money. How might you save this money? Productivity will go up, and insurance claims will go down. When deciding whether or not to upgrade your equipment, you should factor in how much you stand to gain or lose based on overall costs and the human factor: the health of your employees. Offer hearing exams for your employees.These exams can assess their hearing health before and after encountering the ambient noise in your work environment. Noise can’t always be entirely eliminated, but it can be reduced to safe and tolerable levels. You should always be proactive any time you have a chance to preserve or protect your employees’ hearing. After all, everyone reacts to sound differently: rotating employees in and out of excessively-noisy areas may be another unexpected but still effective solution. This entry was posted on Friday, August 18th, 2017	at 9:09 am	. Both comments and pings are currently closed.